form from the web portal of IAF is www.airmenselection.cdac.in and candidates will appear in the Recruitment Rally, it will be conducted at Government Degree College, Siddipet, Telangana from 22-12-2018 to 24-12-2018 from 6 AM onwards. Candidates will be shortlisted based on the Written Test, Physical Fitness Test, Medical Examination, Adaptability Test-I, Adaptability Test-II. For other details of educational qualification, salary, Exam Pattern, Syllabus, selection process details are given below for the IAF Airmen Group Y (Non-Technical) in Medical Assistant Trade Govt Jobs Recruitment 2018. The available vacancies for the IAF Siddipet Govt Jobs is given below. The qualification for the IAF Airmen Group Y (Non-Technical) in Medical Assistant Trade posts is candidates should have completed Intermediate/ 10+2 with minimum of 50% marks in aggregate and 50% marks in English Language. For selected candidates during training the stipend is Rs.14600/-, after completion of training the salary will be Rs.26900/-. The candidates will be shortlisted based on the Written Test, Physical Fitness Test, Adaptability Test-I, Adaptability Test-II, and Medical Examination. The recruitment rally will be held for the IAF Airmen Govt Jobs is from 22-12-2018 to 24-12-2018. Candidates who are qualified in Physical Fitness Test are eligible for written test. The result will be displayed on the same day of examination. Candidates who are selected in Adaptability Test-II are will be examined in the month of January 2019. For more information candidates can refer in the official notification. 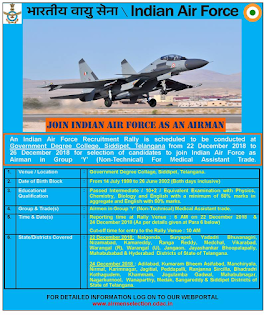 Interested and eligible candidates can download the application form from the web portal of IAF is www.airmenselection.cdac.in and candidates will appear in the Recruitment Rally, it will be conducted at Government Degree College, Siddipet, Telangana from 22-12-2018 to 24-12-2018 from 6 AM onwards.